It's quite overcast and gray this morning. But we lament not, for the gorgeous neighbourhood jays fill my eyes with brilliant blue even when the sky remains dull. What fun it is to watch them scan the area and then swoop in for a peanut in a shell. More than one is preferrable, if they can jam the second into their bills. They do check first to see if the shell is full or not. Smart birds, no use trucking off empty shells -- they must feel the weight, too light and they discard it for another. Then, depending, they will either find a spot to hide their treasure, burying it under dead leaves up against the fence or under little snowy mounds. Or, climb to a safe spot on a bare branch and beak away at the shell until a nice plump peanut pops out... just in time for breakfast. Peck, peck, peck. And so my morning begins with a glimpse of heaven in shades of blue. 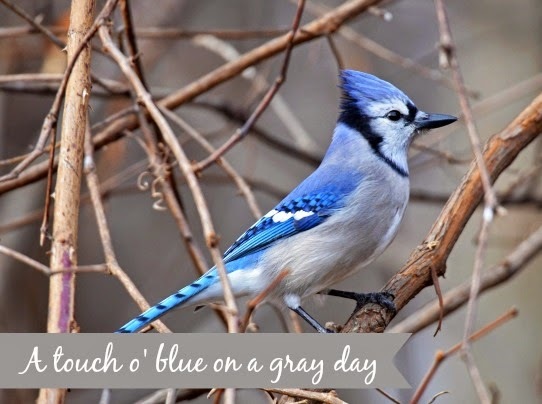 Such a beautiful bird, the blue jay, even if he is a bit raucous! Blue Jays are beautiful birds, even though they can be a tad mean to other birds sometimes. Dear Brenda - how can one resist those lovely birds with their shades of blue. They are very eye catching and love seeing them at my feeders as well. Have a delightful day. Brenda, such a beautiful bird, even if it is sometimes a bit feisty! Feisty is a great word to describe the blue jay, Linda Kay! They are so beautiful. I'm glad you're enjoying the current "view from your window," Brenda. Sometimes the unrelieved grey can drag down one's spirits. Then it's time for tea! He's a handsome fellow! They brighten things up around here, too. That is a cheerful sight outside your window! You're right, you know. We must look for color and cheer amidst the grey...it's there!